The Massachusetts Gaming Commission said MGM Springfield generated about $2.4 million in state revenues in its first week open. The Massachusetts Gaming Commission said monies generated from taxes on MGM Springfield are allocated to several specific state funds. 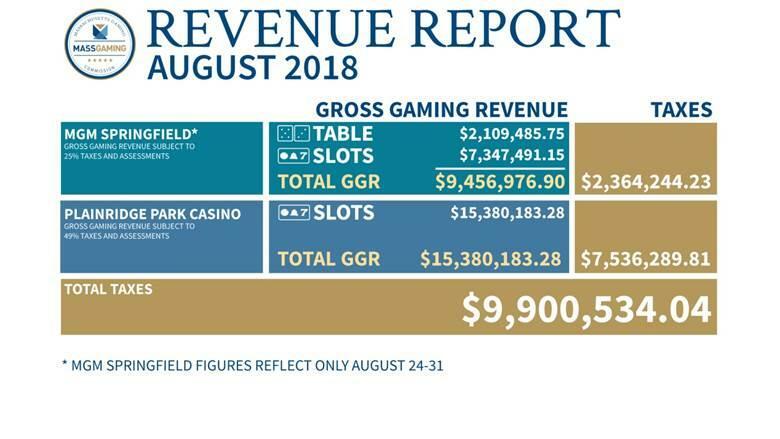 The state Gaming Commission said in a revenue report Monday the casino earned $2.1 million in gross revenues from table games and $7.3 million from slot machines from its August 24 opening to August 31. That translates to about $2.4 million in state revenues. Massachusetts assesses a 25 percent tax on the hotel, casino and entertainment complex's gambling revenues. If revenues keep that pace, the casino would take in about $430 million in a year. A state contractor projected MGM would see $500 million in annual gambling revenue, but not until its third year. The Massachusetts Gaming Commission said MGM Springfield generated about $9.5 million from gambling operations in its first week open, resulting in about $2.4 million in state revenues. In a statement, MGM Springfield's president said the report shows a "tremendously successful" opening week, but cautioned that it only reflects a snapshot of the casino's early performance. A measured tone is probably a good idea for now. The state's first legal casino, the Plainridge Park slots parlor, saw revenues dip by nearly 40 percent from its first full month (July 2015) to its sixth. Sean Teehan contributed to this report, which includes information from The Associated Press. The developers of a proposed $650 million sports and water park resort in Palmer, Massachusetts, are looking to the state to cover some costs. The MGM Springfield casino has been open a week, and casino officials say they did a brisk business during their first three days.